Peel your pomegranate and remove all the arils for garnish. Mix together your pomegranate juice and amaretto. Add your Canada Dry Ginger Ale and stir to combine. When ready to serve, add ice and to your cup and add the punch. 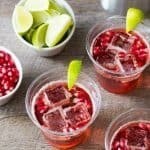 Sprinkle with pomegranate arils and garnish with a lime wedge.